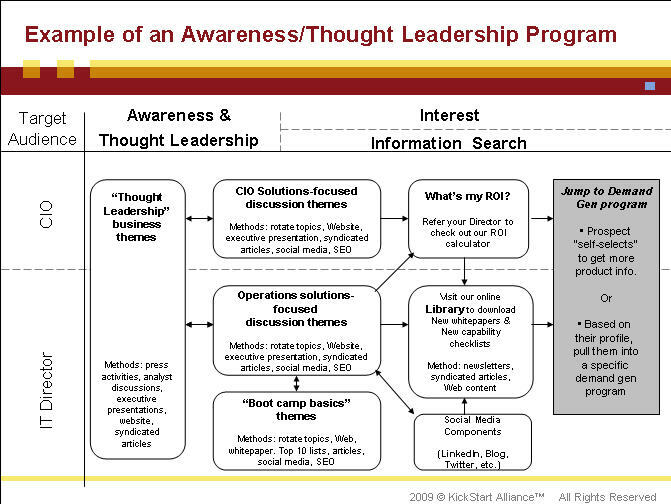 An example of an awareness / thought leadership marketing program. Click to enlarge the image. 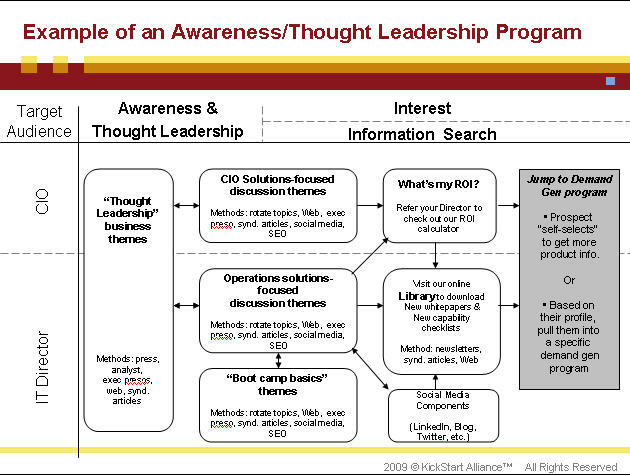 One of the most common types of marketing programs are the “awareness & thought leadership” programs. This specific program has the objective of focusing the company on the business and solutions topics the customer cares about. Instead of immediately diving down to the feature-rich technical jargon, this program marks an important step to communicating to customer executives that we truly understand their business issues. It positions us as business partner, and thus allows us to take a consultative approach in dialoguing with customers and prospects. Reading left to right, notice that we’ve identified the intended target audience on the left. (Personas would have been developed in detail prior to designing this blueprint.) Across the top, the customer’s buying behavior has been listed — in this case moving from “awareness” to “interest”. The first step of expressing interest is usually seen in the prospect searching for information. (This is not an comprehensive example; other forms of engaging in awareness and interest activities will be covered in future posts.) Like branding, this type of program is best viewed as an ongoing investment in creating and maintaining “aircover” for your marketing efforts that will frame specific product launches and promotions. Each box in the blueprint references a “theme” and the “marketing methods” (i.e. articles, Web, executive presentations) used to communicate the theme. We cast our net wide by starting with business topics that should appeal to both the CIO and IT director. Popular themes can be thought of as the “what” themes: — What industry trends will influence the industry? or What impact can we expect the current economy to have on consumer behavior? or What are the three primary investment priorities for telco CIOs in 2010? For best results, a company may have one or two business themes that will be explored all year. It’s best to be focused. Next, we move on to solutions-based themes. Think of these topics as “how” themes — How will companies balance containing costs while protecting the network? or How are companies maximizing the ROI of their outsourced functions and programs? These topics tend to get more specific in prescribing a criteria for success. For best results, a company may entertain 2-3 solutions topics that support each business theme, per quarter. 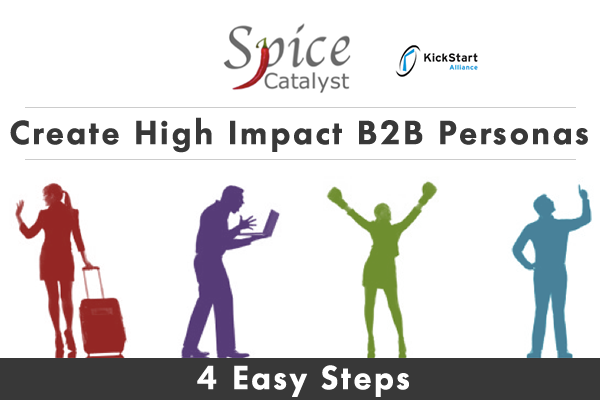 This allows additional solutions topics to unfold over time, thereby providing flexibility to leverage new product launches and current events that may impact buyer behavior. Notice that in neither the business-topics nor the solutions-topics have we put our product in the headline. This is important. The value that your company brings is in sponsoring these topics and providing business and solutions savviness. Via your sponsorship, customers will make the connection to your products and services. Like chapters in a book, these discussion topics will build and evolve each quarter, providing rich content for prospects to review and respond to. But our marketing efforts are only just beginning. Ultimately, the best qualified leads are the ones who seek us out. So, we whet their appetite with our business and solutions topics, and we give them an opportunity to raise their hand to request more information. And, we’ll be on the look out for prospects who exhibit certain behavior based on the topics they find of interest and the information they share with us along the way. (I’ll share some best practices on establishing lead qualification criteria and scoring in a later blog post.) In either case, we’ll be ready. That’s when our demand generation programs kick in and we actively confirm that they are indeed qualified as we quickly stream them through the sales cycle. Next month I’ll share an overview of a couple of blueprints for demand generation programs. For more information, please read Marketing Campaign Development.